Most congregations today exist in what George Thompson calls the "middle of anywhere." They live comfortably with their surrounding culture, focusing their energies on serving the needs of the current members. These congregations have many strengths and gifts that they can exercise without changing a thing. 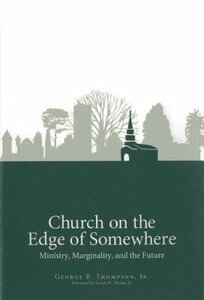 But Thompson envisions a deeper, more prophetic call for congregations to explore the meaning of being in the world but not of it--a church on the "edge of somewhere." Thompson sees a church that is deeply engaged in ministering to the community while calling on others to commit to doing the same. By analyzing the interaction between a congregation's focus of identity and their stance with the world, Thompson has created a helpful grid for congregations to place themselves on today's cultural map. A congregation that sees itself as existing on the margins of society will look different than one that sees itself as embedded in society. A congregation that hears a call to serve the surrounding community will look different from one that focuses on its internal needs. Knowing where they stand now is the key for congregations to discover where they must go in the future to fully live out their call to be God's people in the world. About "Church on the Edge of Somewhere"
George B. Thompson, Jr. is Associate Professor of Church Administration at the Interdenominational Theological Center in Atlanta. He holds a Ph.D. from the Chicago Theological Seminary and other doctoral degrees from San Francisco Theological Seminary and the Claremont School of Theology. He is an ordained Presbyterian minister and the author of several books, including Alligators in the Swamp: Power, Leadership and Ministry.